On the vernal blot the shadow of the higher stone passes across the lower stone 15 m away, allowing the shadow to just reach the top of the lower stone. The two stones are both leaning about 8° and their straightened up positions have been calculated. It is the positions of the stones after these adjustments that were used to calculate the sun line. 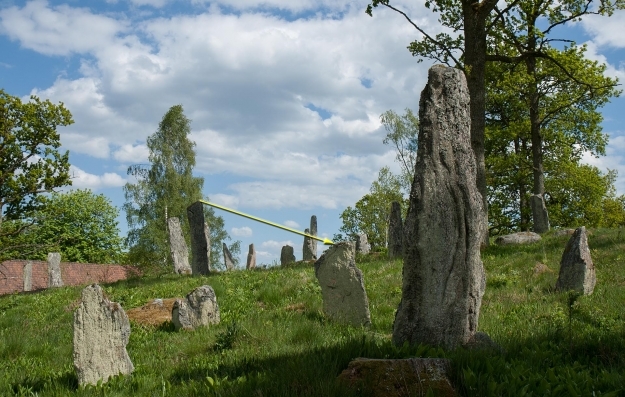 After adjustments of the leaning stones the shadows movement across the stone is exactly correct based on 31st March 645, exactly a half moon cycle after the spring equinox, defined as the day before spring equinox according to today’s definition. That is to say the day when day and night are of equal length under the influence of sunlight’s refraction in earth’s atmosphere (“refraction equinox”). Since the two stones are leaning the shadow will not be in the correct position to show the vernal blot today.